The marketing campaign for 2009’s Brothers did the film no favors. The trailers, as well as the movie poster, suggest that the film is a domestic horror-thriller. 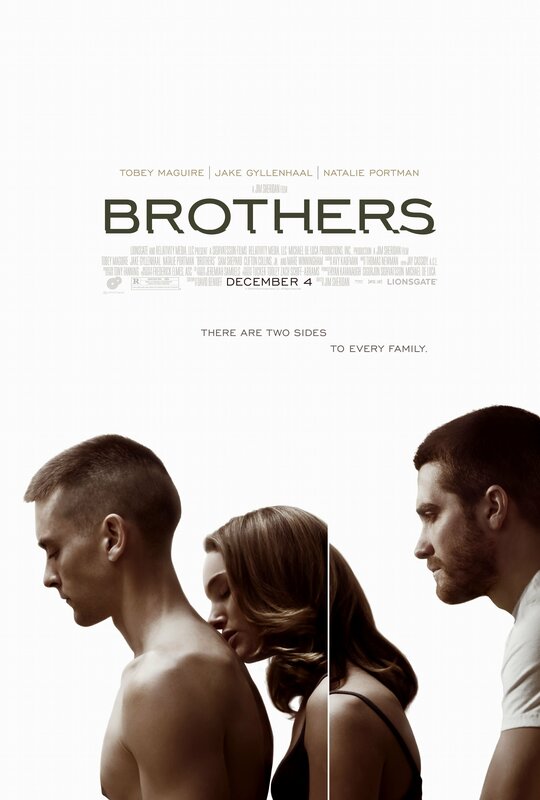 The impression they give is that when Sam Cahill (Tobey Maguire) goes to serve his country in Afghanistan, his brother Tommy (Jake Gyllenhaal) swoops in and takes over his life state-side. Perhaps the trailers give away the fact that Sam is presumed dead for some time, which is what allows his wife Grace (Natalie Portman) to loosen her defenses and allow Tommy to become close to herself and her two young girls. But the music turns to a pounding percussion as Sam returns, rage in his eyes, ready to place bullets in the hearts of his back-stabbing family for their infidelity. It’s this lame-brained concept that turned myself – and I’m sure many others – away from the film upon its release, making it an almost entirely forgotten novelty a mere three years later. Those advertisements suggest a film that is most interested in creating contrived, outsized conflict. I’m about to spoil the movie for you – or rather, salvage it. The movie is actually nothing like that. In fact, its careful and precise rendering of the main players in this small family makes it a remarkably down-to-earth picture even when things go broad in the third act. It handles Sam’s inability to process a “normal” life after returning from war in a way that reminded me strongly of the damaged psychological state of the characters in Black Snake Moan; its over-arching frustrated helplessness struck me as reminiscent of In the Valley of Elah. Though Tommy and Grace do become close in Sam’s absence, their connection is understandable given the great loss they’ve both suffered. They both believe that one of the closest people in their lives is dead. It’s only natural that they lean on each other in this troubled time, and as they do so they realize that their initial perceptions of one another were mistaken. Some refer to this section of the movie as slow. The action cuts to shots of Sam, still alive in Afghanistan, being degraded and tortured by his captors – if you’re watching the movie as a recreation of its trailers, you might understandably be wondering when are they just gonna get to what we all know is coming already! But this movie is not that movie. Grace hated Tommy because he was recently released from jail for armed robbery: she thinks she knows what kind of person he is. Tommy, likewise, remembers Grace as the stuck-up cheerleader from his high school years and is initially resistant to her hospitality, which he sees as false. When Sam’s “death” is initially revealed, Tommy screams at his brother’s wife, hurling his car keys at her and storming away in anger. Yet when they admit their pain to each other is when the two grow close. Grace sees Tommy not as a potential replacement for her husband, but as the one other person who saw Sam for the man he was, rather than the Marine he was. Even his parents seem to think of him as a soldier first and foremost. As they connect, Grace sees a different type of person underneath the cold facade that Tommy shows to the world, and he sees her as more than his brother’s trophy wife. This is performed with a tenderness and a sure-footedness that makes the scenes of Gyllenhaal and Portman together totally inviting. When Sam returns to his life, a new dynamic is added to the plot. The closeness that Grace and Tommy shared is no longer necessary, but re-adapting to a world in which they are not so close with one another proves difficult. Sam is able to see the connection they share with ease, which makes him suspicious of the relationship they formed in his absence. But part of what drives this, too, is the horrors he faced while at war – they’ve left an indelible mark on his psyche that he can’t seem to shake. He sees the simple playfulness of Tommy and Grace but he cannot have that anymore. It eats away at him. His memories eat away at him. His daughters sense this detachment and grow fearful of their own father. And this is what the movie is about, really. More is spoken in the way that Sam lies with eyes wide open, tightly clutching his family to his side, than is said in any of the screaming arguments that the trailers have prepared us for. Much more is said in the way that Tommy hugs his brother tightly upon his return than when he tries to soothe him by saying the phrase “You’re my brother” repeatedly. And if you’re looking for horror, there’s so much more uncomfortable tension in the way that Grace cautiously approaches her husband after being accused of being unfaithful – uncertain what he is capable of – than when he makes explicit what he is capable of by finally lashing out. Because the bulk of the film is not about making a political statement about the war or about playing up indiscretions, whether real or imagined. Instead, it’s about examining the state of mind of these three people and what they use to cope with their distress. It gives them time for their personalities to unfold, so that by the end even if things get out of control from the perspective of the plot, the characters’ states of mind is all too easy to understand. That said, there were certainly aspects of the movie which felt like huge missteps. The pacing at the start of the film was off to the point of being distracting, quickly introducing Tommy and expecting the audience to accept his close relationship with his brother and the resentment he faced from his father, then shipping Sam out immediately afterward and showing him shot down over the ocean all too quickly. The soundtrack at this point in the film was all rock’n’roll and electric guitars, a particularly bizarre choice when the images on-screen are showing the impact which supposedly killed Sam and his crew. The father character was one that felt extremely under-developed, a collection of traits (alcoholism, abusiveness) attributed to being a veteran of Vietnam, yet never really fleshed out any further than this. There’s a scene where he tells Sam that he understands what it’s like to return from war and is willing to listen if his son needs to talk, but the moment goes no further and ultimately feels unimportant. This is unfortunately how most of the father’s scenes come across. But these complaints don’t detract from the excellent, moving performances of the three leads. The movie gives them a humanity that I simply had not expected, crafting an intense portrait of realistic characters reacting sincerely to great sorrow. It’s disappointing that marketing for this movie was geared toward selling a high-concept gimmick (two brothers, one girl! who will the victor be?) when being honest about the movie’s much more limited scope gives it so much more appeal. I’m aware that this is a remake of a Danish film of the same name; I have not seen that film and therefore cannot comment on the relationship that this one shares with the original.